As usual, please read my Obligatory Obama Disclaimer if you haven’t already. While many apologists are dismissing the above quote from the Wall Street Journal, the reality is that the last couple of weeks have been unprecedented in the number of scandalous events to hit a presidential administration. While any single one may not be technically bigger than Watergate (at least from what we currently know), the series of events shows a potential scale of corruption in a presidential administration unmatched in the history of our country. 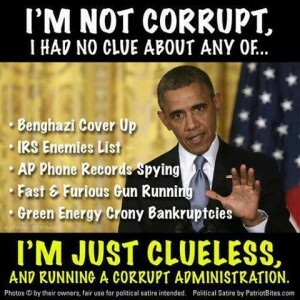 The next point apologists bring up is that we have no evidence that Barack Obama had anything to with any of these scandals, or any of the previous scandals that now require careful re-examination. Whatever the issue (pick your poison: Fast and Furious, Bengazhi, the IRS abuse of power, or the Justice Department wiretapping journalists’ phones), the president has steadfastly denied any knowledge of the improprieties. 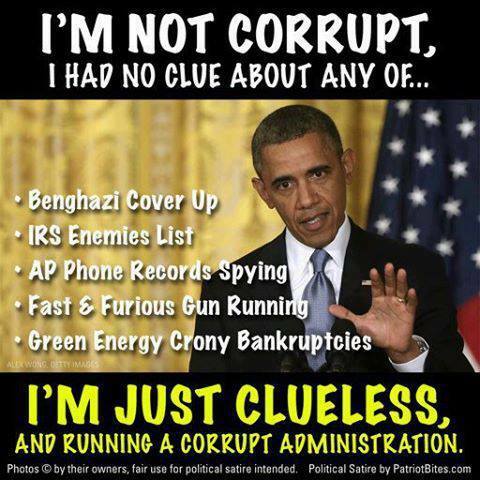 This leaves us two possibilities: Either Obama is lying – or he is one of the most incompetent presidents in history. Let’s get down to brass tacks. Barack Obama holds the office of president of the United States. His job is to run the executive branch of the federal government. He is the head honcho of the Justice Department, the State Department, and the IRS. He is the one who appoints the heads of those individual departments, but just like any chief executive, ultimately the operation and actions of all those departments are his responsibility. Let’s not gloss over that word: responsibility. Assuming he wasn’t directly in charge of ordering the various misconducts or poor decisions that his departments carried out, as head of the executive branch, the fault still fundamentally falls on his shoulders. Regardless of all the posturing going on by politicians all all sides, the bottom line is that Barack Obama has NOT accepted any responsibility for those under his administration. While the conduct of the various departments in discussion are all inexcusable, the biggest scandal to me is the outright refusal of Obama to own up to even a shred of fault. One of the core principles of leadership is to take responsibility for the actions of those they lead. Obama has up to this point only offered to take action against those who he thinks will end up being at fault. Not once have I heard him say publicly that as leader of those departments he is ultimately responsible and will accept any repercussions. And in his capacity as chief executive, I certainly have not heard him apologize for the actions of those departments. Bottom line, however these scandals play out, the undeniable reality is that instead of acting like a leader, Obama chose to defer responsibility to his subordinates. That is irrefutable fact. Those are the actions of a coward. Unless he reverses course and accepts responsibility for the actions of his administration, Obama has abdicated his duty. Ultimately, the people of this country are his superiors. It is time to live up to our mistakes and accept our own responsibility. So I do now: Mr. President, if you can not effectively lead and accept responsibility for the faults of your own administration, please tender your resignation immediately.